These boats will take you on a sailing adventure without requiring an adventurous budget. 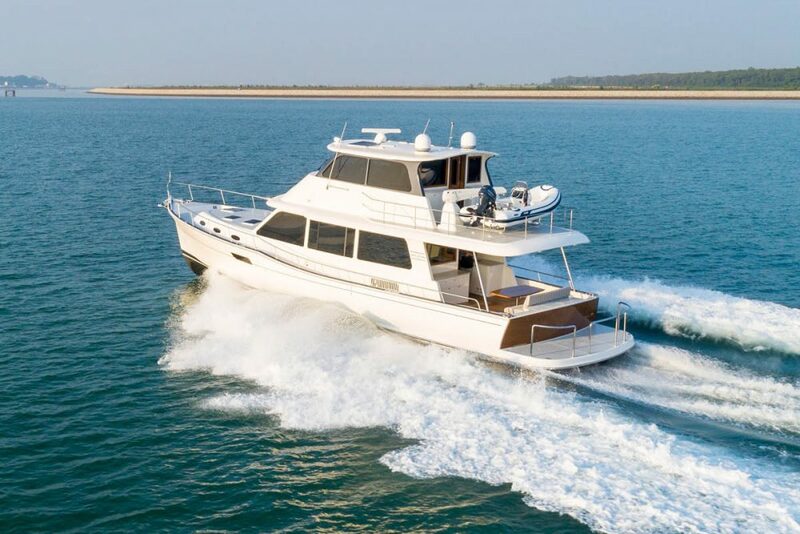 Camping cruisers and seagoing daysailers are often confined to the world of designer drafting boards, passionate debates on wooden boat forums, and late-night garage projects. 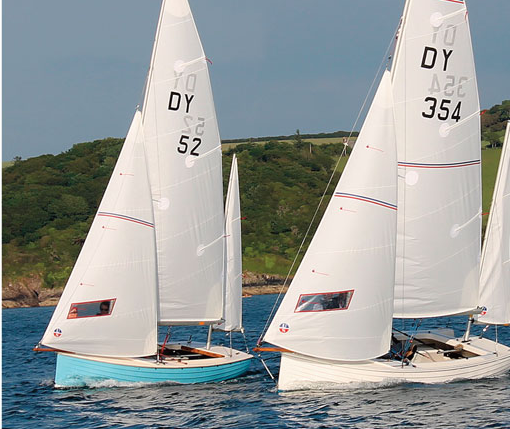 New and used production boats are relatively abundant in the UK, but they are quite hard to find in the US with a limited number of distributors. The Bay Raider 20 is a versatile camping cruiser. There are some good models to consider in this size/type. Here are the seven that caught my eye on a recent listings search. The Sea Pearl 21 is a double ender with the lines of an old whaleboat. 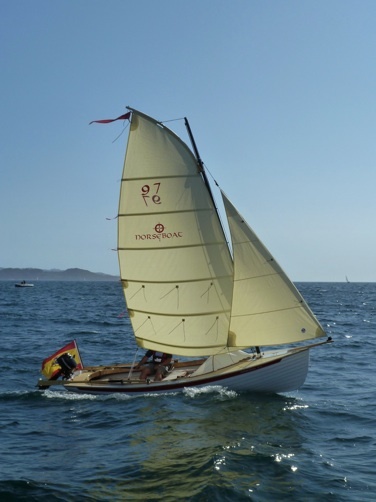 Built by Marine Concepts in Florida, the Sea Pearl is a double ender along the lines of an old whaleboat. The boat is half-decked with two cockpits and 2 mast Marconi rig. Reefing is simple by just rotating the masts. A handy convertible tent that looks somewhat like a pram hood can cover the forward cockpit area, or can be rolled up when not needed. Unlike other models, there is no centerboard with this boat; instead there are two weighted leeboards. This opens up more space for camping and storage. Water ballast can also be added for additional stability. The narrow stern does limit the engine size, but at $16,000, these boats are a great value. Marine Concepts also makes a trimaran version for added stability. The Bay Raider combines an old-style rig with a modern look. The Bay Raider is a gaff-rigged yawl, but with a more modern take. She is the largest and beamiest on this list, allowing for more room in the cockpit. The distinctive feature is a water ballast system that allows owners to add or remove water for more or less stability. This gives the boat a lot of flexibility in different wind conditions. Other nice touches include a step in the rudder to climb back onboard, and an angled leg on the tiller to keep it from hitting knees during tacks. 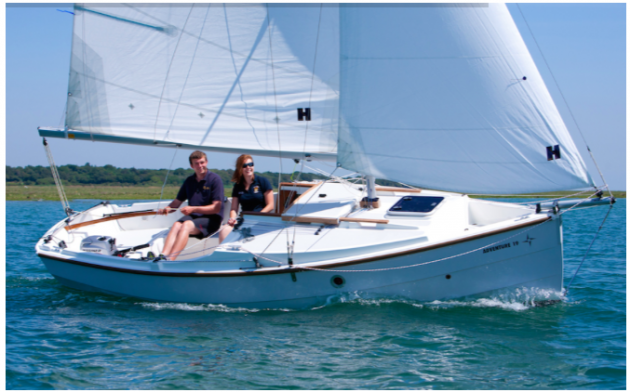 An optional asymmetric spinnaker and bowsprit adds another dimension to the Bay Raider. For more protection you will need a spray hood, or you can upgrade to the expedition version, which comes with a small cuddy cabin. The Cornish Adventure has a simple Bermuda rig. The Adventure series is a Bermuda-rigged version of the Cornish Shrimper series, a UK classic that has been in production for over 40 years. 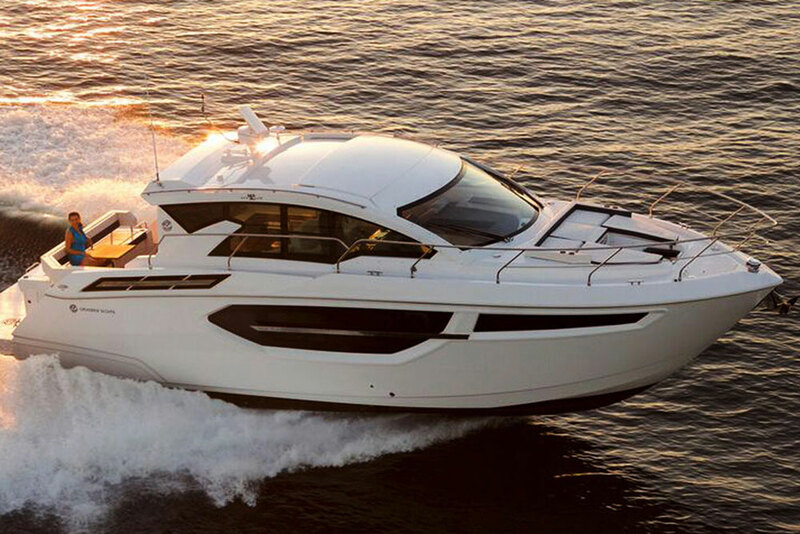 This is the closest boat to a real pocket cruiser with interior, basic electronics, and even a forward hatch. I like the Bermuda rig for simplicity and sailing performance, and there are several sail controls to appeal to those who like tweaking. An asymmetric spinnaker on a small pole provides a nice addition for downwind sailing, although it does extend the LOA to 21 feet. The layout is well balanced between a large uncluttered self-draining cockpit and a cabin with room for portapotty, stove, and tiny sink. The base boat comes with an outboard engine configuration; they also offer a 9HP inboard diesel option. 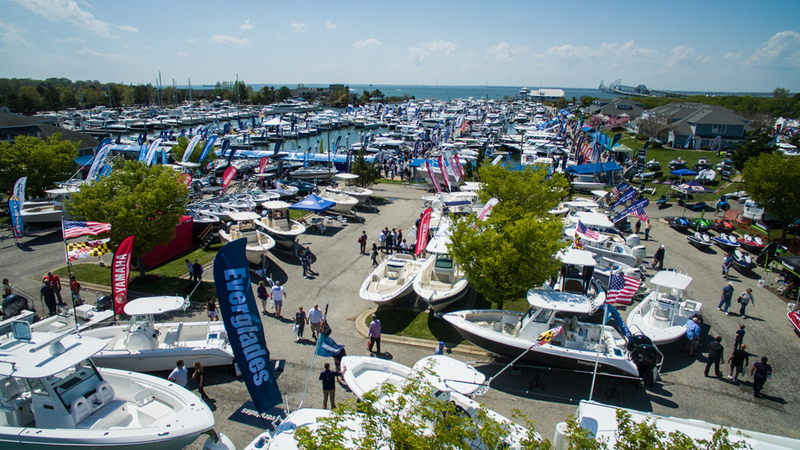 UK-located models start at $39,000; US pricing is available from Forum Marine on the Chesapeake Bay. The Norseboat can be sailed and rowed equally well. The norseboat concept is simple: seaworthy, high-performance sailing and rowing boats with classic lines that can be sailed and rowed equally well. the concept transfers well to camping cruisers or motorized launches. And this unique combination of freestanding carbon mast, gaff yard that doubles as mainsail storage, and beautiful lines nails it. A sprayhood can be added for protection against the elements and there is also a tent for camping. To keep weight down for rowing, they have made some compromises - a composite centerboard means less stability, and a full-length keel will slow tacking under sail. There are three models in the range: 12.5ft, 17.5ft and 21.5ft. The middle model sells for around $20,000. The Drascombe Lugger is the grandfather of camping cruisers. 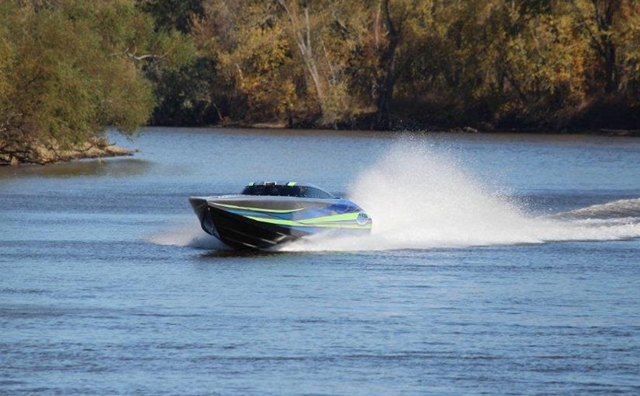 These boats invented the category and have been around forever. The yawl design has been so successful it has not really changed from the simple gaff main, jib and mizzen. Tanbark sails give the Lugger an authentic look. A loose-footed main means no boom to worry about and enables the sails to easily be wrapped around the mast. 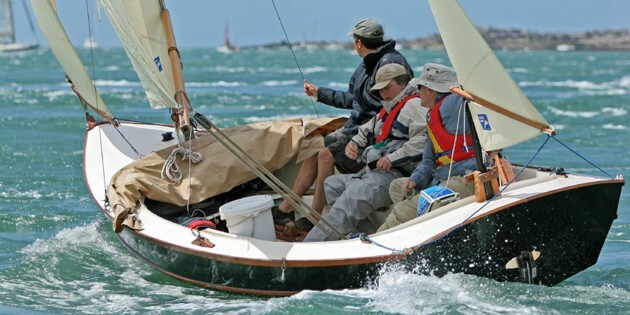 Luggers have the smallest sail area of the group, so don’t expect great performance. They have a large open cockpit with plenty of room, a steel centerplate, and a recessed engine well. This design falls under ”if it ain’t broke, don’t fix it." Most boats are in the UK, but new custom boats are available from East / West Boats, and there are a few used boats for sale in the US. The Com-Pac has an innovative rig that raises the sails with the mast. Like the Cornish Adventure, the Legacy also has the look of a pocket cruiser - just a bit smaller. 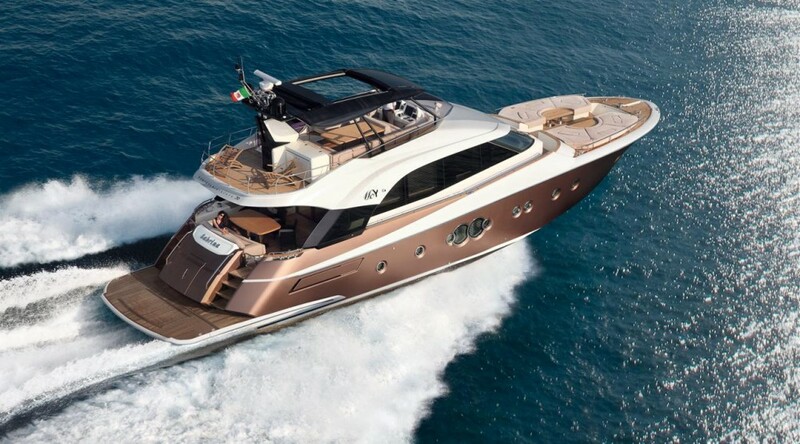 It is amazing what they packed into this small hull: a small cabin with sleeping for 2 and space for a porta potty, along with a spacious cockpit for several adults. 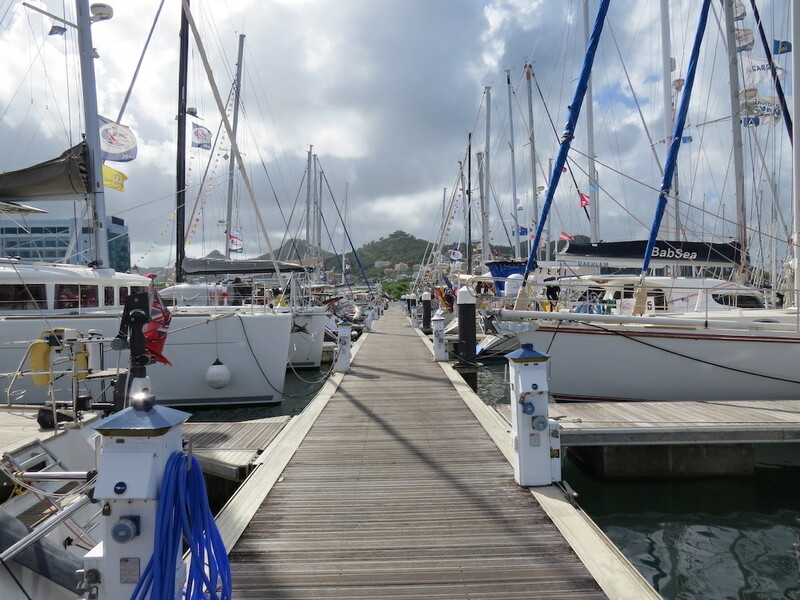 The most innovative aspect of this boat is the mast-raising system: sail and boom are all stowed with the mast and unfold as the mast is raised. A boom gallows also helps store the boom above the cockpit when not sailing. 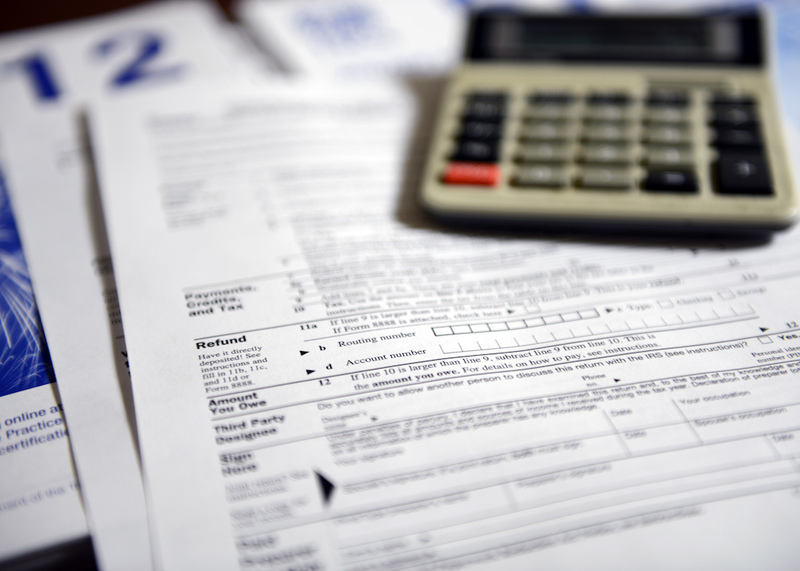 The cost is attractive, with base prices starting around $11,500. 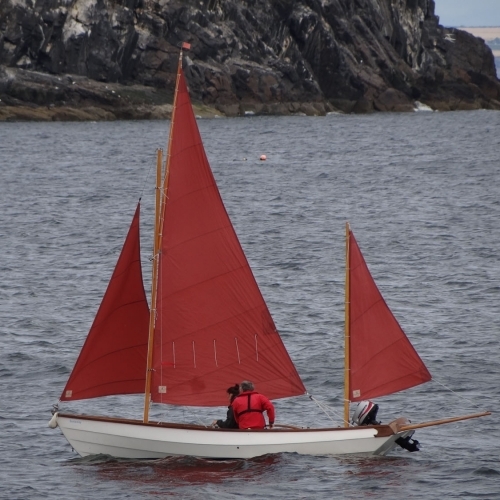 The Devon yawl is the smallest of the group. With ancestry traced back to the small inshore fishing vessels in the southwest of the UK, Devon yawls have a reputation as tough all-weather dayboats. While they are designed less for camping and more for safe daysailing, what I like is their simplicity. 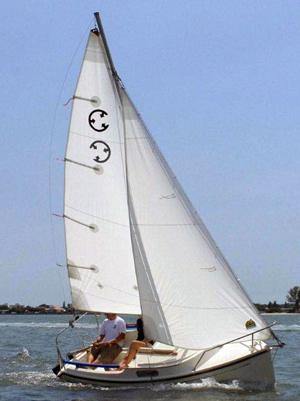 They have a straightforward Bermuda rig with mizzen and aluminum spars, a roomy cockpit, and a 170 lb cast iron centerplate and a further 144 lbs of lead ballast for plenty of stability. They are available in the US as a custom build, or new and used production boats are available if you pay for shipping from the UK. Hull #1 is currently for sale on YachtWorld for around $15,000. Length 16'0" 16'7" 17'7" 18'0" 19'3" 20'0" 21'0"
Beam 6'3" 6'0" 5'1" 6'3" 7'3" 7'0" 5'7"
Draft 4'7" 3'7" 3'1" 4'0" 4'0" 4'8" 2'7"
Any of these boats would make a good camping cruiser, and your choice will come down to personal preference on rig and size. For the budget-conscious, finding a used Lugger would be the best option. 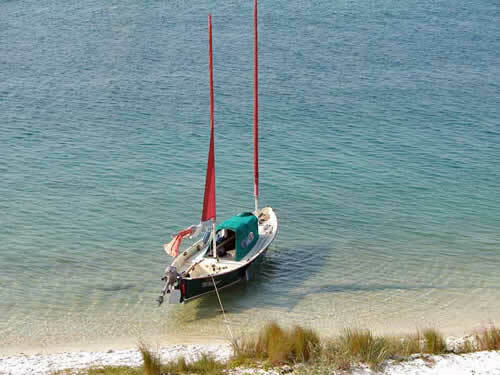 And then you can cast off for your favorite island and do some back-to-basics adventure boating! Find more camping cruisers for sale on boats.com.